with wooden houses, small shops and eateries. 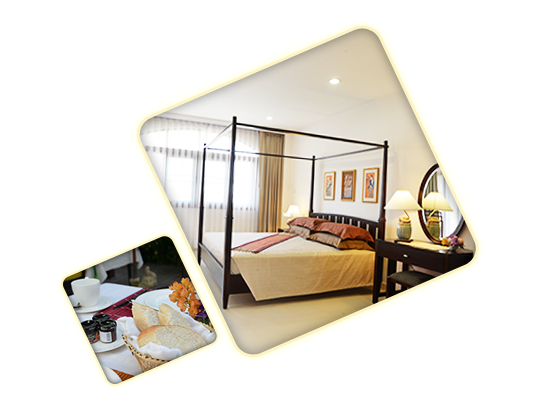 amenities, 24 hrs free Wi-Fi and 24 hrs security. afternoon tea, evening drinks and canapes. The Ma-Yom Tree restaurant offers contemporary Thai, Lanna and international cuisine. the Three Kings Monument, the Saturday & Sunday Walking Streets, and local dining outlets which can be reached within a 5-15 minute walk. The Chiang Mai International Airport and the Night Bazaar are only a 15-minute drive. Transfer service from the chiangmai Airport, Train & Bus stations can be arranged upon request at a chargeable fee. We speak Thai, English and French.